Only two months ago it seemed inevitable that the Chicago Sun-Times would be bought by Tronc, the parent company of the Chicago Tribune. Then came a surprising twist – a coalition led by former Chicago Ald. 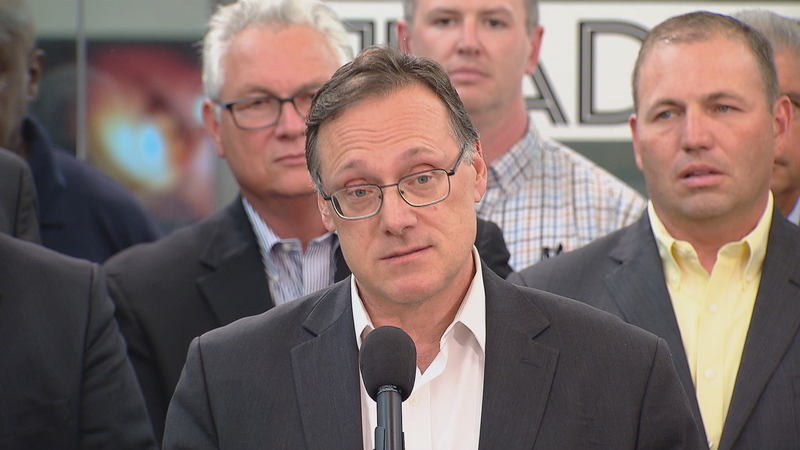 Edwin Eisendrath that includes some clout-heavy unions stepped up with the financing needed and closed the deal last week. Now comes the tough part: turning around a paper that’s posted huge losses and reassuring critics concerned the new owners will have certain editorial expectations. Last week, Sun-Times publisher Jim Kirk told Chicago Tonight he’s confident the firewall around the newsroom is not threatened. “I don’t expect, given what I’ve heard over the past couple of days, that we will have any issues with that, and if we do, it stops with me. And I’ve had assurances by everyone in that group that there will be no breach of that,” Kirk said. The group of investors includes the Chicago Federation of Labor, whose president, Jorge Ramirez, is set to serve as the paper’s chairman; prominent businessman Elzie Higginbottom; attorney Len Goodman, whose clients include former Gov. Rod Blagojevich; and former ABC 7 News anchor Linda Yu. Heading up the group is former 43rd Ward Ald. Edwin Eisendrath, who will be the new Sun-Times CEO. Eisendrath represented Lincoln Park in the City Council from 1987 to 1993, when he resigned to become a regional director for the U.S. Department of Housing and Urban Development. The 59-year-old Chicago native and Harvard graduate also unsuccessfully tried to unseat two sitting Democrats in primary elections: former 9th District U.S. Rep. Sidney Yates in 1990 and Blagojevich in 2006. In recent years, Eisendrath has been working as a managing partner with the consulting firm StrateSphere. His wife, Jennifer Schulze, is a former news director for WGN-TV who’s now a principal at the small-batch liquor brand Halsted Vodka. Eisendrath’s brother John, also one of the investors in the Sun-Times, is a television producer and writer. Edwin Eisendrath joins Chicago Tonight for a conversation. July 13: The Sun-Times publisher and editor-in-chief talks about the newspaper’s new owner and what’s ahead for the 69-year-old paper. July 12: A group of investors led by former Chicago Ald. Edwin Eisendrath has completed its purchase of the Chicago Sun-Times and the Chicago Reader. June 5: The Chicago Sun-Times is for sale, and Tronc—the parent company of the Chicago Tribune—has already signaled an intent to buy the paper. But the Department of Justice is giving others an opportunity to get in on the action.